"Spider-Man: Homecoming" is not so much a reboot of the franchise as an integration of the character into the new Marvel Comics/Cinematic Universe ... and, unlike its predecessors, this "Spider-Man" forgoes back-story and, instead of concentrating on "Spider-Man" the crime-fighter (though, of course, there is a evil new villain, the Vulture, played byb Michael Keaton), it concentrates on Spider-Man-the-high-school-student, humanizing him and bringing the audience closer to the character than ever before (much like the wonder of this year's "Wonder Woman," where we learn to fall in love with Amazon Diana). A young Peter Parker/Spider-Man (Tom Holland) begins to navigate his newfound identity as the web-slinging super hero. Thrilled by his experience with the Avengers, Peter returns home, where he lives with his Aunt May (Marisa Tomei), under the watchful eye of his new mentor, Tony Stark (Robert Downey, Jr.). Peter tries to fall back into his normal daily routine -- distracted by thoughts of proving himself to be more than just your friendly neighborhood Spider-Man -- but when the Vulture emerges, everything that Peter holds most important is threatened. Co-stars Jon Favreau and Zendaya. Extras for Spider-Man: Homecoming include "The Spidey Study Guide," an entertaining pop-up factoid track with facts on the movie in relation to the comics; 10 deleted scenes; gag reel; seven featurettes: �A Tangled Web,� �Searching for Spider-Man,� "Spidey Stunts,� �Aftermath,� �The Vulture Takes Flight,� �Jon Watts: Head of the Class� and �Pros And Cons of Spider-Man�; four "Rappin� With Cap: Captain America PSAs; photo gallery. From Sony. Also due this week: "Girls Trip ," a well-acted and directed film about four college best friends -- the "Flossy Posse" -- who are reunited by lifestyle guru Ryan Pierce (Regina Hall) for a trip to the Essence Music Festival in New Orleans when she's offered the opportunity to be the keynote speaker. The other three -- played by Tiffany Haddish, Jada Pinkett Smith and Queen Latifah -- jump at the opportunity to rekindle their college-day friendships, and the story follows their adventures as they relearn their affection for each other. There's some great set pieces, lots of chemistry and warmth and, thankfully, a dearth of bathroom-raunchy humor. Co-stars Larenz Tate, Mike Colter and Kate Walsh. Extras include deleted scenes; a gag reel; "Planning The Trip" behind-the-scenes featurette with cast and crew; "Outrageous Moments" on-set hijinks; "The Essence of NOLA" featurette on New Orleans and the Essence Music Festival; extended performance �Because of You� by Ne-Yo; and deleted scenes with commentary by director Malcolm D. Lee. From Universal. Stanley Kubrick bent the conventions of the historical drama to his own will in "Barry Lyndon " (1975), his dazzling vision of brutal aristocracy, adapted from a novel by William Makepeace Thackeray. In picaresque detail, "Barry Lyndon" chronicles the adventures of an incorrigible trickster (Ryan O'Neal) whose opportunism takes him from an Irish farm to the battlefields of the Seven Years' War and the parlors of high society. For the most sumptuously crafted film of his career, Kubrick recreated the decadent surfaces and intricate social codes of the period, evoking the light and texture of 18-century painting with the help of pioneering cinematographic techniques and lavish costume and production design, all of which earned Academy Awards. The result is a masterpiece -- a sardonic, devastating portrait of a vanishing world whose opulence conceals the moral vacancy at its heart.On DVD, Blu-ray Disc, with new 4K digital restoration, with uncompressed monaural soundtrack on the Blu-ray; alternate 5.1 surround soundtrack, presented in DTS-HD Master Audio on the Blu-ray ... 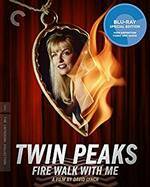 In the town of Twin Peaks, everyone has their secrets -- but especially Laura Palmer (Sheryl Lee). In "Twin Peaks: Fire Walk with Me ," the prequel to his groundbreaking 1990s television series, David Lynch resurrects the teenager found wrapped in plastic at the beginning of the show, following her through the last week of her life and teasing out the enigmas that surround her murder. Homecoming queen by day and drug-addicted thrill seeker by night, Laura leads a double life that pulls her deeper and deeper into horror as she pieces together the identity of the assailant who has been terrorizing her for years. Nightmarish in its vision of an innocent torn apart by unfathomable forces, "Twin Peaks: Fire Walk With Me" is nevertheless one of Lynch's most humane films, aching with compassion for its tortured heroine -- a character as enthralling in life as she was in death. On DVD, Blu-ray Disc, with restored 4K digital transfer, supervised by director David Lynch; 7.1 surround DTS-HD Master Audio soundtrack on the Blu-ray, supervised by Lynch; alternate original 2.0 surround soundtrack, presented in DTS-HD Master Audio on the Blu-ray. "God of War " (2017 -- Hong Kong), starring Sammo Hung and Vincent Zhao, pirates ruled the Chinese coastline during the 16th century, pillaging the small villages and terrorizing the citizens. When maverick leader Commander Yu (martial arts legend Hung) enlists the help of a sharp young general (Zhao), they devise a plan to defeat the pirates. A violent clash of wit and weapons will decide who will rule the land in this historical drama from veteran action director Gordon Chan. 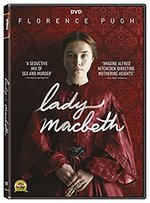 On DVD, Blu-ray/DVD Combo from Well Go USA ... In "Justice " (2017), starring Stephen Lang, Jamie-Lynn Sigler, Nathan Parsons, Jackson Rathbone and Quinton Aaron, it's 1868 and the Civil War has been over for three years. An old, abandoned mine is now being transformed into a military stronghold by a corrupt mayor and a band of bloodthirsty outlaws hell-bent on reigniting the war. When a U.S. 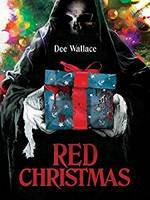 Marshal comes to town only to find out that his brother, the town priest, has been murdered, his search for the killer leads to an inevitable clash that becomes a life or death struggle for a much greater cause. On DVD, Blu-ray Disc, from Universal ... Shout! 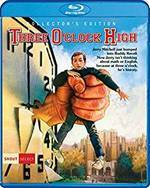 Factory this week brings us the Blu-ray debut of "Three O'Clock High " (1987), starring Casey Siemaszko, Annie Ryan, Richard Tyson, Stacey Glick, Jonathan Wise, Jeffrey Tambor, Philip Baker Hall and John P. Ryan. A nerd gets himself in hot water with the new bully, a quiet bad boy who challenges him to fight on the grounds of their high school after the day's end. Extras include audio commentary with director Phil Joanou, �Head of the Class� interview with Joanou, �Passing the Test� interviews with screenwriters Richard Christian Matheson and Tom Szolossi, �School Clothes� interview with costume designer Jane Ruhm, theatrical trailer, still gallery. In "The Midwife " (2017 -- France), legendary French cinema stars Catherine Deneuve and Catherine Frot command the screen in this a emotional drama, the latest film from acclaimed writer-director Martin Provost ("S�raphine"). The film tells the tale of devoted maternity hospital midwife Claire (Frot) and B�atrice (Deneuve), Claire�s late father's free-spirited mistress from decades ago, who resurfaces in Claire�s life to announce that she has brain cancer. Though the two women are virtually polar opposites of each other, they both embrace life in their own unique way. Might the two be able to develop some kind of relationship and rely on each other at this point in their lives? From Music Box Films ... 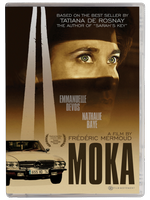 In "Moka " (2016 -- France), starring Emmanuelle Devos and Nathalie Baye, a grieving woman pursues a couple whom she suspects of killing her son in a hit-and-run in this moody, riveting psychological thriller. Adapted from Tatiana de Rosnay's bestselling novel, "Moka", winner of the prestigious Variety Piazza Grande Award at last year's Locarno International Film Festival, follows Diane Kramer (Devos), who travels to �vian in search of the mocha-colored Mercedes that she believes killed her son. Overwhelmed with grief and desperate for answers, she tracks down Marlene (Baye), a beauty salon proprietor and owner of the vehicle. In order to get closer to her, Diane pretends to be a potential buyer for the car, but the path of revenge is far more tortuous and complicated than it seems. From Film Movement. 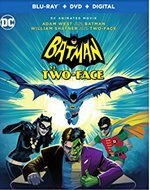 "Batman vs. Two-Face" (2017)is a new DC Entertainment animated feature. As the sequel to the 2016 hit animated film "Batman: Return of the Caped Crusaders," this film finds Batman and Robin back in classic 1960s action, protecting Gotham City from some of the most nefarious villains in comics history. But when the mutilated master of multiplicity, Two-Face, begins staging a daring crime wave across Gotham, the Caped Crusaders must work double-time to discover his mysterious secret identity before they can halt his evil-doing -- all the while combating the likes of Catwoman, Joker, Riddler, Penguin, Bookworm, Hugo Strange and King Tut. The late Adam West leads the star-studded cast in his final performance as Batman, delivering an inspired turn opposite fellow pop culture icon William Shatner as the criminally conflicted Harvey Dent/Two-Face. The cast also boasts two more pop culture icons of the 1960s: Burt Ward is back for more �holy� fun as the Boy Wonder himself, Robin, and Tony Award winner Julie Newmar reprises her role as the fiendish feline, Catwoman. On DVD, Blu-ray/DVD Combo, from Warner ... In "Shopkins: World Vacation" (2017), the sequel to 2016's "Shopkins: Chef Club," Kooky Cookie win the trip of a lifetime to London, but it's not long before plans start going awry ... soon Kooky Cookie and her pals are hopping from Paris to New York to Tokyo. But with the mischievous Biscuit Bandits on the loose, can the Shopkins and Shoppies save the day? Includes two sing-along karaoke songs. From Universal. "The Skyjacker's Tale " (2016): Ishmael Muslim Ali was convicted of murdering eight people at a golf course in the U.S. Virgin Islands. After years of trying to get his conviction overturned, he took matters into his own hands and hijacked an airplane full of passengers to Cuba on New Year�s Eve in 1984 and got away with it. After thirty years on the FBI most wanted list, this is Ali�s first interview since the hijacking and includes never before seen footage. Is he a heartless criminal or a victim? The audience must decide. From Strand Releasing. 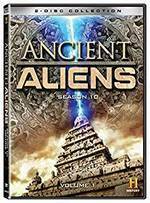 "Ancient Aliens: Season 10, Volume 1" (2015) is a two-disc set with all eight episodes. Join renowned ancient astronaut theorists as they explore the new evidence regarding the existence of extraterrestrials and extraterrestrial intelligence using newly declassified documents from all over the world. Uncover more astonishing new evidence of extraterrestrial intervention on Earth than ever before, including an aluminum object that resembles the foot of a lunar lander ... but inexplicably dates to over 40,000 years ago. In India, a thousand-year-old mask is discovered that looks identical to the face of a grey alien. Newly uncovered records from Russia indicate that in 1948, an ancient rocket was discovered in Kiev. Is it possible that we are on the brink of a reconnection with our alien ancestors? On DVD, Blu-ray Disc from Lionsgate ... "America: Promised Land" (2017) showcases the building of America as a nation through the telling of historical events. Everyone knows America is the land of immigrants, but how much do we really know about what drove those migrations in the first place? "America: Promised Land" uncovers the great forces in history that helped shape the country we live in today. Told primarily through enhanced graphics, this HISTORY documentary special follows the migratory journeys of real people in history, revealing surprising and mind-blowing facts along the way (including the creation of the postage stamp by the Irish, the aid Germans provided to the Union Army in the Civil War, the Great Migration of African-Americans to the North and West, and much more). Each chronological hour focuses on a specific theme -- Land, War, Opportunity, and Disaster -- to tell the story of how the experiences of our ancestors determined how we ended up where we are. From the producers of "America: The Story of Us." 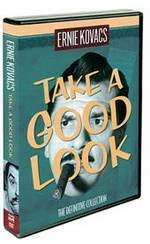 On DVD, Blu-ray Disc from Lionsgate ... "Ernie Kovacs: Take a Good Look" (1959-61) is a seven-disc set with all 49 episodes of this truly offbeat game show hosted by Ernie Kovacs. Kovacs was a consummate comedian, influencing TV funnymen such as Johnny Carson, David Letterman, Jim Henson, Pee-wee Herman, Billy Crystal, as well as Monty Python and "Saturday Night Live." "Take a Good Look" is Kovacs�s aphoristic �if a tree falls in the woods� answer to the panel quiz show. Kovacs turns the secret guest show formula on its ear and almost inverts it. "In Take a Good Look," it's the host who gives the panel hints about the secret guest�s identity and in the form of surreal sight gags, blackouts and sketches. The clues only really make sense if you know who the guest is, to begin with. Throughout the series� run, different approaches were taken to address this. Early on in Season One, Kovacs himself has trouble explaining the show�s formula to the home audience. Throughout the show�s two seasons, panelists periodically complain to Ernie that the clues don�t make sense; there�s one show where Hans Conried protests, �Please, Ernie � tell them it�s rigged!� All in all, it is Kovacs who seems to be enjoying the game the most, making these crazy blackouts as well as the commercials for Dutch Masters cigars. You watch the episodes of this game show and wonder �Did this really air on network television?� Airing October 22, 1959 to July 21, 1960, and October 27, 1960 to March 16, 1961 on ABC, Take A Good Look hosted an eclectic mix of guest stars, such as his then wife, Edie Adams, Carl Reiner, Zsa Zsa Gabor, Mort Sahl, Our Gang�s Jean Darling, chess world champion Bobby Fischer, Major League Baseball�s Rogers Hornsby, White House Butler Alonzo Fields, Los Angeles Dodgers Chuck Essegian and Don Drysdale, Hawaiian Congressman Daniel Inouye, Miss America 1959 Mary Ann Mobley, several Olympic athletes, and many more. The Library of Congress, who acquired the entire collection of the Ernie Kovacs and Edie Adams in 2015, has digitized, restored and preserved the material contained within this DVD set. In all, that is more than 20 hours of additional rare Kovacs material. From Shout! Factory.